Cratloe claimed the Canon Hamilton Cup with an eight point victory over a disappointing Crusheen outfit in the showpiece event of the Clare hurling calendar. There was nothing showpiece about this game as Cratloe led from start to finish while Crusheen never showed the fight and hunger that has been acustomed to their play. Their final tally of six points is the lowest scored in a Clare senior hurling final since O Callaghans Mills notched 1-03 in the County Final of 1990. Cratloe captain, Liam Markham opened the scoring with a free in the middle of the field with just twenty seconds played. All-Star, Conor Mc Grath strengthened their lead with less than a minute gone. They could have raised a green flag shortly after only for a vital hook by Cian Dillon prevented a certain shot on goal. Sean Collins put his name on the scoresheet with eleven minutes on the clock to give the South Clare side a three point advantage. Former Clare hurling captain, Paddy Vaughan got Crusheen off the mark when the game was thirteen minutes old with a placed ball. All-Ireland winning minor from 1997, Gearoid Considine increased the Cratloe lead at the middway stage as his shot sailed straight between the sticks. Conor Mc Grath and Paddy Vaughan exchanged frees to leave a three point gap between the sides with seventeen minutes played. Points from Sean Collins, Cathal Mc Inerney and Conor Mc Grath before the interval gave Cratloe a seven point lead heading in at the break. Crusheen custodian, Donal Tuohy was called upon early in the second half as he pulled off a fantastic save to deny Conor Mc Grath from finding the back of the net. Paddy Vaughan reduceed the deficit to six points with a dead ball with four minutes gone. Mc Grath added to his account with a free on the seventeenth minute mark. Paddy Vaughan raised a white flag with eighteen minutes played to cut the gap but Cratloe responded with a Cathal Mc Inerney effort. Brothers David and Podge Collins both pointed to give Cratloe a nine point lead with twenty four minutes played. Conor Mc Grath struck straight between the posts with twenty six minutes on the clock to bolster his side’s lead. Crusheen responded with points from cousins Colin and Paddy Vaughan, but it wasn’t enough to stop Cratloe from securing a historic second Senior hurling championship. John Carmody’s Crusheen never seemed to get going in this clash. It appeared as if they had rarely done shooting drills in training as they hit twelve wides in the sixty minutes, nine of them coming in the first half. It’s not often that six points will win a challenge match, let alone a County Final and their inability to score was a major factor in their downfall. It’s very unlike Crusheen to let the occasion affect them, but their failure to win their first five puckouts coupled with the high wide count in the first half, suggests that it did. 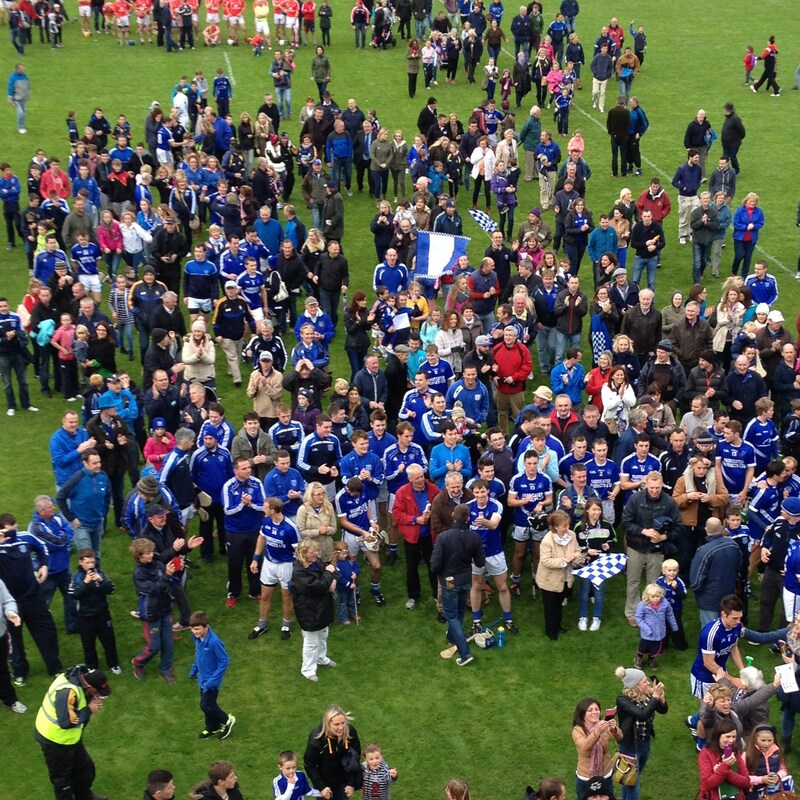 The Champions of 2010 and 2011 suffered with injuries as Alan Brigdale, Joe Meaney and Jamie Fitzgibbon were not at one hundred percent for this affair, had they been Crusheen would have certainly put it up to Cratloe. Crusheen definitely didn’t do themselves justice on the day, but they must be admired for defying the odds and making the final as that is no easy feat. Shaun Dillon, Paddy Vaughan, Donal Tuohy and Cian Dillon did best for Crusheen. Going into this clash, all the talk was on the Crusheen backs but major credit has to be given to Cratloe’s defence as they completely dominated proceedings and didn’t give an inch to the Crusheen attack. The Joe Mc Grath managed side were by far the better team and although there was long stages in which Cratloe failed to score, the result never looked in doubt for the majority of the tie. They were wasteful in front of goal and like Crusheen they hit twelve wides, but the crucial difference was they hit fourteen points to slightly cover up their periods of inaccuracy. Next up for the Cratloe hurlers is a Munster quarter final with Ballygunner of Waterford in what will be a tough encounter, but their attention is solely on the County football final versus Éire Óg next weekend. Conor Ryan put in a solid display sweeping up that came his way, at midfield they ruled they roost with Liam Markham conducting the Cratloe choir throughout the hour while Martin Oige Murphy showed great fight and determination, prior to the match a lot of talk was on the current County forwards that Cratloe possessed but Gearoid Considine rolled back the years with a fine performance, Conor Mc Grath proved why he’s one of the best in the business as he always looked dangerous and Sean Collins as always got vital scores to steady the ship when needed. After the game, capatain Liam Markham collected the Canon Hamilton off Michael Mc Donagh, chairman of the Clare County Board. Murphy, Liam Markham (0-01 1f), Shane Gleeson, Podge Collins (0-01), Sean Collins (0-02), Cathal Mc Inerney (0-02), Gearoid Considine (0-01), Conor Mc Grath (0-06 4f). Subs: David Collins (0-01) for Gleeson (36:38), Barry Duggan for O Leary (58:01), Damien Browne for Considine (60:49), John O Gorman for D Ryan (61:04), Philip Gleeson for Chaplin (62:28). Crusheen: Donal Tuohy, Jason Greene, Cathal Dillon, Alan Brigdale, Ciaran O Doherty, Cian Dillon, Shaun Dillon, Fergus Kennedy, Paddy Vaughan (0-05 3f), Gearoid O Donnell, Gerry O Grady, Alan Tuohy, Conor O Donnell, Joe Meaney, Colin Vaughan (0-01). Subs: Darragh O Doherty for A Tuohy (41:58), Jamie Fitzgibbon for Meaney (46:25), Cronan Dillon for G O Donnell (54:58), Conor O Loughlin for Brigdale (62:39). Referee: Seanie Mc Mahon (Newmarket on Fergus).